I can't believe that we have come to the end of Summer of Color 2012. Six weeks of art inspired by ice creams! 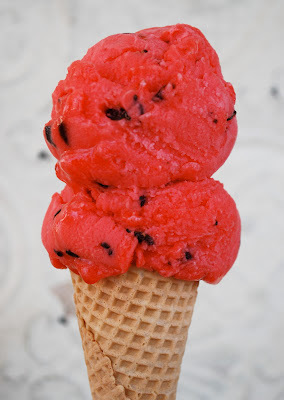 And this week's ice cream was Watermelon Ice. During last week I was invited to join a Facebook group: The Dyan Reaveley Art Journaling Fan Club! So to celebrate I used only Dyan's inks and stamps for this page. Sadly she hasn't brought out a white journaling pen (yet!?) and none of my white pens wanted to play except my Staples Correction Pen and even that was temperamental. However I managed in the end. Bernice this is a gorgeous page. Beautiful details. I really like this piece - those birds are so cute and I love the way you've used the white to add detail - very effective. Beautiful background too! OMG, this is so LOVELY!. The birds are gorgeous, they look so happy :). Beautiful background, I could see maybe a little bit of stamping there?. Great work!. Hugs. Gorgeous rich red! I love this! This is beautiful and I love the quote! Fabulous art journal spread! Love how you used her goodies with the Summer of Color red and black theme! Love this and love that quote as well!